OK — so let’s all pretend we have American Express black cards. The sky’s the limit and no one will judge you for spending a cool million during a weekend-long Vegas trip. We’ve done a Vegas suite guide, but now we’ve gathered a list of the fun and quirky Vegas room amenities you can get while you’re here. There’s really no particular order to this, so feel free to take your pick. The Palazzo’s Prestige lounge is way fancy. You might forget that you have an equally fancy Prestige suite. We love the lounge’s amenities, which include live piano music on the weekends. Photo courtesy of Vegas.com. What better way to kick off your Sin City vacay than an evening cocktail reception coupled with live piano music? Talk about fancy. 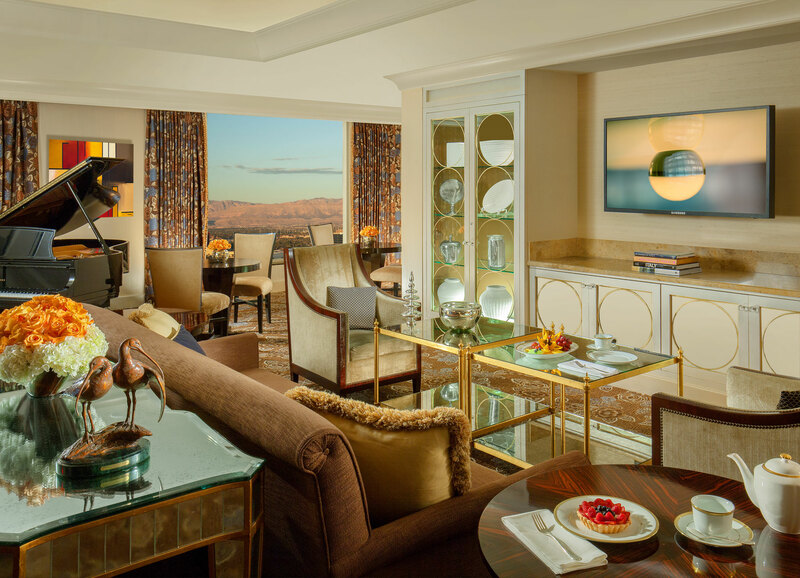 This is one of many perks you’ll get when you stay at The Palazzo’s Prestige suite. You’ll full access to the Prestige lounge which offers complimentary afternoon coffee and tea, hot and cold appetizers and an evening cocktail reception. The lounge hosts live piano entertainment on Friday and Saturday evenings. One of the suite’s spiffy in-room amenities includes a pillow menu. Honestly, we could test these puppies all day and night. Good night, sleep tight and enjoy the sounds of nature when you wake up. Hey, we really like the sound of that. MGM Grand Stay Well suite, photo courtesy of Vegas.com. At MGM Grand’s Stay Well suite, you won’t have to worry about an annoying alarm clock with a snooze button you can’t seem to hit. Instead, each Stay Well room comes equipped with a dawn simulator alarm clock that gradually awakens the body with increasing levels of music or nature sounds accompanied with gradually increasing light. How peaceful is that? It’s like camping (or glamping) with all the perks of a hotel. The room even has cedar baseboards for a fresh, woodsy scent. All you’re missing are birds and bunnies greeting you by your bedside. Another great perk: If you have to go to the bathroom in the wee hours, the night light has LED lamps that create pathways without disrupting your melatonin levels for sleep. Plus, you won’t stumble and knock into any furniture like most of us have. At Aria, you can wake up to sunshine with a curtain opening that you can time yourself. How invigorating! Another fun Aria room amenity includes an in-room tablet that has an All Off button. Like the name suggests, you can turn off and control everything with one simple tap. Drinking orange juice is great, but a vitamin C shower is even better. Drinking glass not required. Photo courtesy of MGM Resorts International. Are you one of those who drinks OJ every morning? We have something that’s even more refreshing than that. It’s one thing to down a glass of vitamin C, but imagine a complete revitalizing shower to start your day. Each MGM Grand’s Stay Well suite has a vitamin C shower designed to neutralize chlorine, as well as promote healthy hair and skin. In addition to a vitamin-packed shower, this suite offers other healthy amenities. You’ll also have access to Cleveland Clinic’s software program, which includes tips on stress management, sleep and nutrition programs. There’s also an in-room wellness channel for more healthy tips. Don’t fret if you’re not in your room too much — you’ll have access to the Cleveland Clinic program 60 days after your stay. Each Stay Well suite has optional aromatherapy and a specialized room service menu created by Cleveland Clinic nutritionists. Lights, camera, action. With personal styling and Hollywood glam vanity mirrors at The Cromwell, you’re the star of the show. Photo courtesy of VEGAS.com. The Nordstrom-owned Trunk Club delivers clothes to your home, or in this case, to your hotel room at The Cromwell. The service starts with a phone or email consultation with one of the Trunk Club stylists. They’ll ask for your size and get a feel for your personal style, as well as looks you typically avoid. Once your stylist gets a better idea, he or she will create a customized clothing trunk just for you. Once you receive your trunk straight to your hotel room, you can paw through the selection, choose what you want and put aside what you don’t. You’ll only be charged for the clothes you pick and the hotel concierge will send back what you don’t want, free of charge. This service rocks because there aren’t any shipping costs or minimum orders. But let’s be real — it also saves you time so you can enjoy every second of your crazy Vegas trip. While you’re getting ready in your Cromwell room, enjoy beauty amenities like the glamorous Hollywood-style vanity mirror. And how many rooms do you know that offer hair straightening irons? Stay at The Cosmopolitan of Las Vegas and you have the luxury of in-room beauty services from the stylists at the hotel’s Violet Hour Salon. Options include make-up applications, hair styling and nail care – all in the comforts of your hotel room. If you really want to drift off to dreamland, in-room massage treatments are also available. This next perk may not be a fashion makeover per se, but you’ll smell like a million bucks. Stay in an Octavius suite inside Caesars Palace and you’ll have the pleasure of spritzing Bvlgari cologne or perfume before your night out. If you love the scent so much that you can’t live without it, go ahead and pack it in your suitcase. The hotel will conveniently add it to your bill. Sweet Lord. The LINQ hotel brought us back to our childhood. It’s not every day you hear of hotels offering in-room board games, let alone these classics. Photo courtesy of Erik Kabik. If you really want to be spontaneous, we’re sure a game of Twister with new friends can jazz up the night. 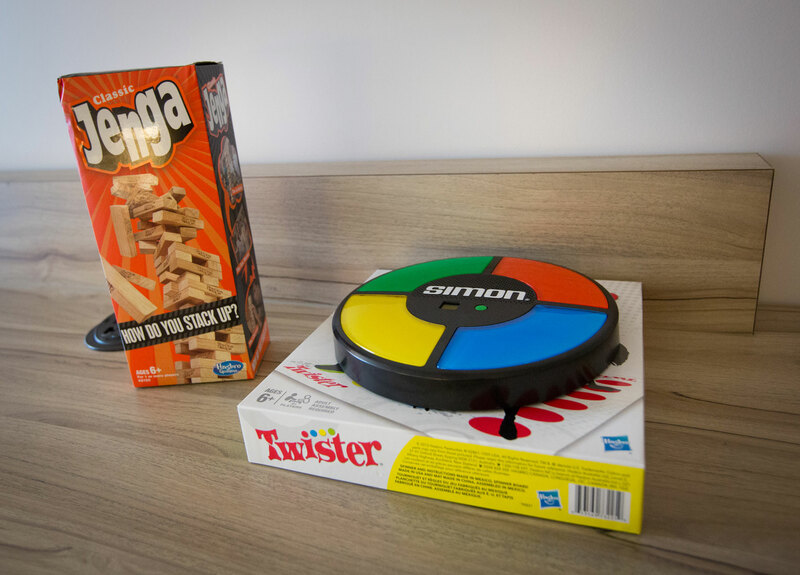 At The LINQ, you can conveniently order board games from your hotel room’s TV. Choose from old-school games like Twister, Simon and Jenga to the controversial but wildly hilarious Cards Against Humanity — all with a simple click on your remote. In addition to board games, The LINQ also offers an in-room fitness cart that can be delivered right to you. The fitness cart has everything from yoga mats to weights. That way, you can practice your downward facing dog and pump iron (do people still say that?) in the privacy of your room. If you really want to break a sweat, the hotel’s fitness center is also open around the clock. If you’re staying in the hotel’s penthouse, there’s an extra-special perk besides in-room board games and a fitness cart: You can also play music from a vintage record player. We’re predicting a VCR and original Nintendo (Tetris, baby) in the near future. The games don’t end here: The Cromwell’s boutique resort offers backgammon or chess tables in select rooms. With the room’s retro Parisian-inspired décor and trunk-style furnishings, you’ll almost want to play in your finest attire and hat. We’re all about a year-round pool party in this swanky Sky Villa. Photo courtesy of the Palms. The 9,000-square-foot two-story Sky Villa at the Palms is like sleeping in your very own nightclub. It has its own glass elevator and a massive sized living room, perfect for your ultimate dance party. We’re truly in love with its glass-enclosed pool that overlooks the city. If you feel like taking a dip at 3 a.m., we guarantee you won’t be the only one. Staying here includes other perks: You’ll also get round-trip transportation in an SUV and weekend butler service in select villas and suites. You and five of your friends have daily access to the fitness center, as well as VIP nightclub passes. Ooh, la la! That view though. The Cosmopolitan of Las Vegas Terrace Suite, photo courtesy of Vegas.com. A lot of rooms may be fancy-schmancy, but it’s hard to find some where you can get breath of fresh air. 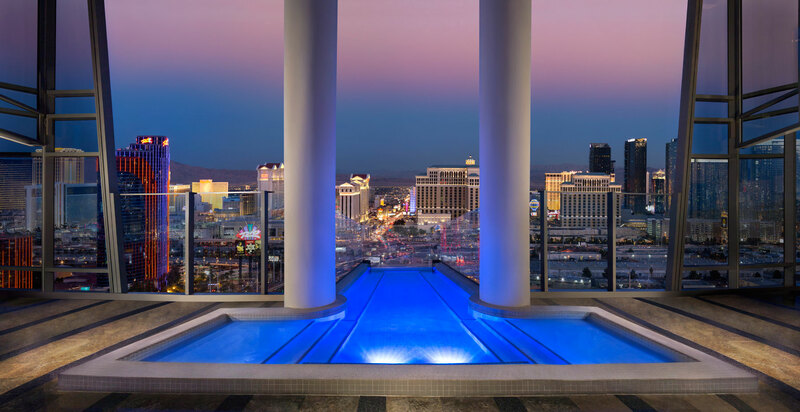 The wraparound Terrace Suite at The Cosmopolitan of Las Vegas offers stellar views of the Las Vegas Strip, complete with three separate entrances. It’s really no surprise why this is one of our favorite suites. Plus, you can program room temperatures, lighting and also music with one remote. The Terrace Suites have a dining nook and kitchenettes if you feel like whipping up all those recipes you see on social media. With an amazing location in the heart of the Strip, we’re totally ready to raise our glass and give a special toast to the awesome view. See where your bed is? At The LINQ, you can jump out of bed, walk to your patio and enjoy cabana services and the pool — just like that. Photo courtesy of Vegas.com. Speaking of fresh air, how about enjoying this and some fun in the sun? Partying in Vegas day clubs is a popular summer must-do. 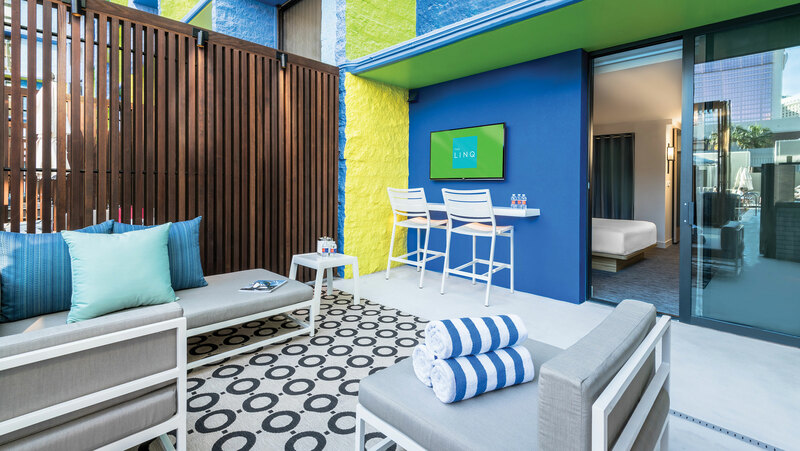 If you don’t want to deal with booking a cabana or daybed, or if you don’t want to venture too far, The LINQ hotel offers its Deluxe Poolside Cabana rooms. Imagine walking out to your private patio and having the luxury of immediate cocktail service. The pool is only a couple of steps away, so you really won’t have to worry about a long walk back. Long story short, the day club pretty much comes to you. If we win, you’re buying us dinner. 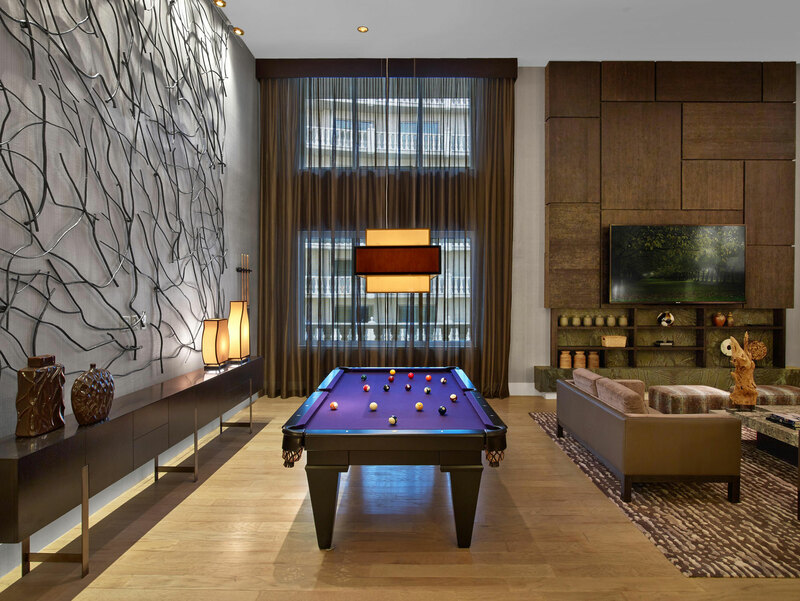 This pool table is one of many amenities you’ll find at Nobu hotel’s penthouse. Photo courtesy of Caesars Entertainment. Why drive out of your way to a seedy bar to enjoy a game of pool? Unless you want to reenact a scene from “Roadhouse,” it’s not worth the trip. Plenty of Vegas suites have their own pool tables. We’ll share with our favorite — Nobu penthouse. Located inside Caesars Palace, the boutique Nobu hotel has a long list of unique room amenities. We love this pool table because, really, how often do you a purple felt-covered pool table? But this David Rockwell-designed penthouse gives us so much to be excited about: From its unique wall designs to the stylish east-meets-west décor, the entire interior is a work of art. The Sake suite also has a pool table. 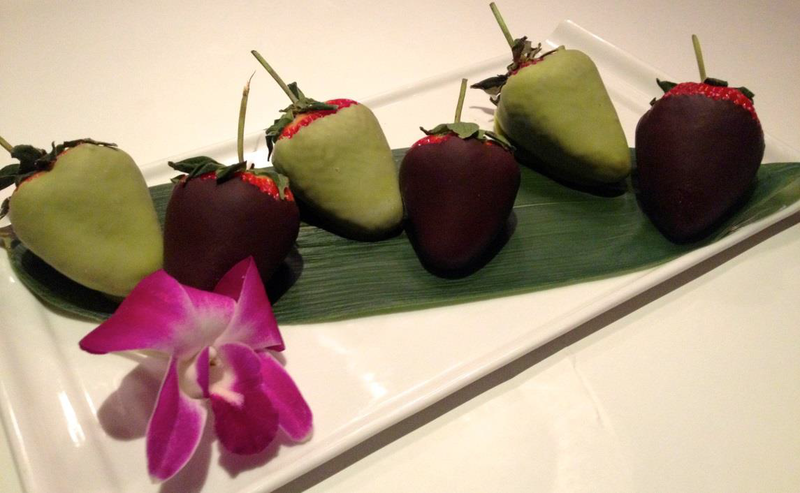 At Nobu hotel, you can savor everything from fine dining or these beautiful green tea and chocolate-dipped strawberries, all from the comfort of your bed. Photo courtesy of Caesars Entertainment. Look, we all love the ambience of fine dining restaurants, but sometimes we just want to enjoy a good meal in the privacy of our room. 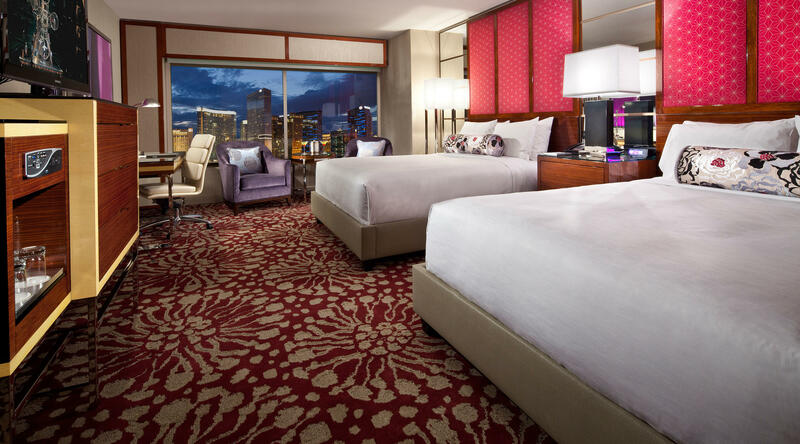 Plenty of Vegas hotels offer in-room dining directly from their world-class restaurants. So if nothing sounds better than devouring a plate of Giada’s best pasta at The Cromwell or Mediterranean delights from Cleo at SLS, you’re in luck. Nobu restaurant at Caesars Palace has an exclusive in-room dining menu for its Nobu hotel guests. Plus, it’s cool how you can order Nobu restaurant food right to your room. We’re totally tempted to enjoy avocado rolls, veggie tempura and seaweed salad in our jammies. You can also order a Japanese-style bento box for breakfast. In town celebrating? Guests at the Nobu penthouse or villa can have their very own personal sushi chef or bartender. Say cheese, Buster! 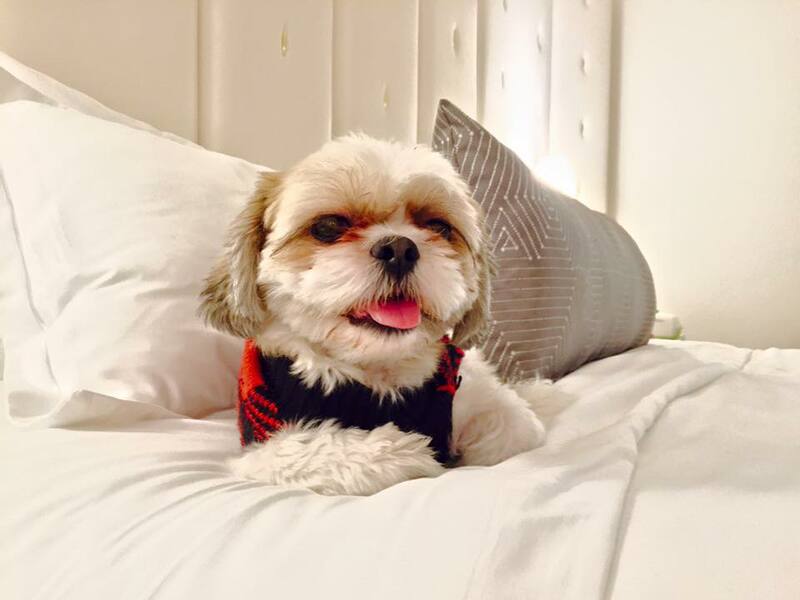 Our doggie’s fine pet stay at the Delano Las Vegas. Photo by Jeannie Garcia. We just did a story about the Delano Las Vegas’ Pet Stay program, but it’s so darn cute we had to mention it again. Not only will your doggie receive complimentary organic cookies upon check in, but the Delano Las Vegas also offers a special doggie room service menu with fun names like Fowl Play or Pooch Patty. And chances are if you’re walking around, your pup will receive superstar attention from the hotel staff and guests. Plus, it’s fun to see your how your pup sinks into the super fluffy bed. Just be careful not to roll over on your little one. At The Cosmopolitan of Las Vegas, all pups receive a special BarkBox package. This includes a collapsible water bowl, chews and treats, a themed souvenir toy and a squeak-less toy (perfect for not disturbing your fellow neighbors). The BarkBox is included in the pet fee. 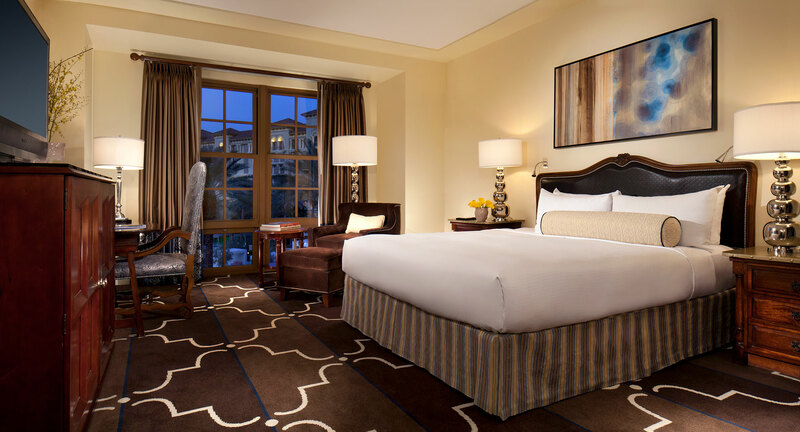 There’s more to Green Valley Ranch than this lovely hotel room. The room service menu is a real treat. Photo courtesy of Green Valley Ranch. Butler-drawn bubble bath: A hotel butler will draw a luxurious and fragrant bubble bath for you and also create an ideal setting complete with scented candles, fresh orchids, and 12 hand-dipped, long stemmed strawberries. The Ultimate Chocolate Aphrodisiac package: This includes eight hand-dipped chocolate strawberries, assorted truffles, truffle martini, and a passion toy box. Hot air balloon ride: Up, up and away: Like the helicopter ride, it also includes a limo ride and picnic basket. 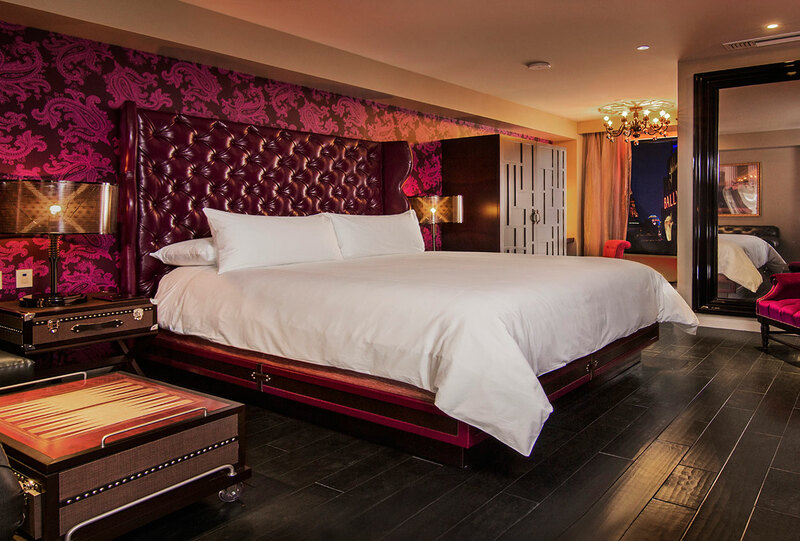 You can also check out our top Vegas hotel suites, as well as our crazy, over-the-top suites and villas and learn about more fabulous Vegas room amenities.